This is a free iPhone app for measuring directivity of loudspeakers, microphones, and other sound sources and receivers. Developed for Hawley's course "Physics 1950 - Electro-Acoustics" at Belmont University, the app is now available for free for engineers, educators, students, and anyone else to use. UPDATE Jan 22, 2018: See our paper in the The Physics Teacher. Note that since we developed this app and submitted the paper in 2016, Apple has made it more difficult to use external audio input. With iPhone 7, even using the Lightning to 3.5mm TRRS adaptor, in concert with a TRRS Y-adaptor for external microphone input does not work, and only the Phone's internal mic is recognized (i.e. the external signal is not recognized). An earbud-headset mic gets recognized and could be used for speaker directivity measurments, but from what we can gather, Apple does dynamic impedance testing to reject external audio inputs which were allowed on, say, the iPhone 5s (which we used for the paper). Apple "recommends" using a dedicated Lighting audio interface such as an iRig for newer iPhones. :-( Without this, we are unable to measure microphone polar patterns on newer iPhones (such as S.H. 's iPhone 7 Plus) because of these new restrictions from Apple. For horizontal rotations, select either the Compass or Gyroscope ("Gyro: Yaw", preferred) settings. For vertical rotations, use "Accel: Gravity." 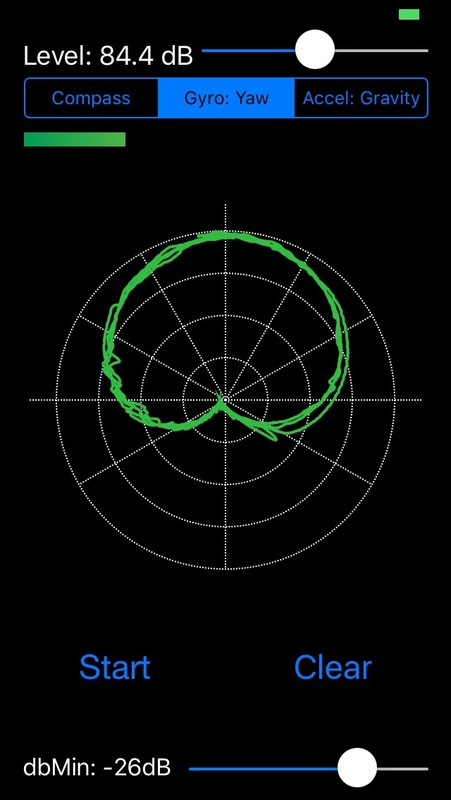 When you press Start, the plot will begin at an angle of "0", which is assumed to be straight-on toward the center of the sound source. After pressing "Stop", you can adjust the dB value at the origin by moving the "dbMin" slider at the bottom of the screen. Using iTunes File Sharing, a .CSV file called "data.csv" is available, which includes a dump of the recent measurements, for use in exporting to other graphing & analysis programs, e.g. Excel. The source code is now on GitHub. Please contribute and help us improve the app!